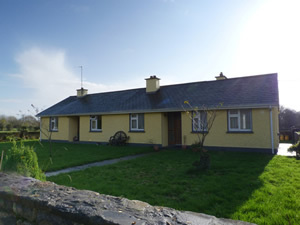 This charming semi detached cottage is located 2 miles from Ballinrobe, 10 miles from lively Claremorris and an hour from Galway city. The cottage offers holidaymakers a taste of real country living with a cosy oil fired stove inviting you to a welcome night in with feet up and a bottle of wine. The area is a very popular fishing are with lake fishing just 500 meters away, Lough Carra and Lough Mask are also close by and are both popular for trout and pike. Ballinrobe Golf club is just 3 miles away or enjoy a day out at the races at Ballinrobe race course.Shop. Pub. Restaurant 2 miles. Beach 17 miles. GF: lounge, kitchen, dining room. FF: double, twin, single, shower room.Electricity and oil central heating included, linen and towels included, oil-fired stove, TV, dvd player, fridge with small ice box, microwave, washer/dryer, partially enclosed garden, private off road parking. Pets welcome.